The download monitor plugin for WordPress allows you to easily monitor, manage and track your digital file downloads. Through the use of shortcodes, you can simply display your downloads on any post or page of your website. Using this plugin you are able to track the date, country, IP and username of someone who proceeds to download one of your items. This documentation will provide you with the basic knowledge needed to offer your users a free downloadable item. To install this free plugin simply click on ‘Plugins‘, ‘Add New‘ and search for the term ‘Simple Download Monitor‘. Click the ‘Install Now’ button and then choose to ‘Activate’ the plugin. Alternatively, you can download this plugin from the Download Monitor Plugin Page. Once you have a file you wish to offer your customers for download you can complete the following steps. 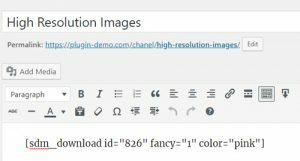 This plugin does not have any restrictions on the file types you can use. Using this plugin you can offer anything from visual images to audio. Once the plugin is active on your WP site, click on the new ‘Downloads‘ menu. Click the ‘Add New‘ button. This will take you to a page with a number of fields relating to your downloadable item. Give your item a ‘title‘ and ‘description‘ (if applicable). Add the downloadable item you wish to offer your users by clicking the ‘Select File‘ button. Add a thumbnail image if you wish by clicking the ‘Select Image‘ button (optional). You can choose to modify the download count by entering in a numeral in the ‘Offset Count‘ field. This will be shown to visitors when using specific shortcodes. You can enter the ‘File Size‘ and ‘Version‘ as numerals in the appropriate fields (optional). ‘Publish‘ your new downloadable item. At the bottom of this page is where you can find shortcodes that relate to the download. You may choose to copy these instead of using the shortcode inserter. 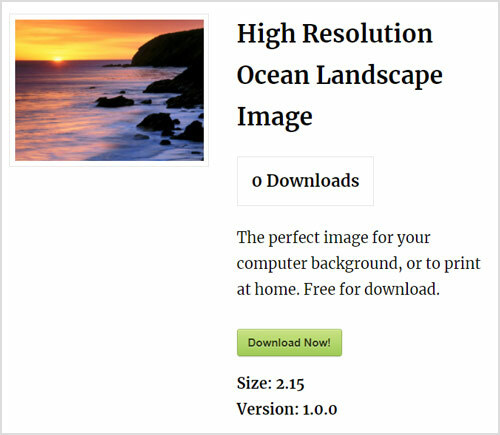 Now that you have created your download, you can now offer this to your users via a WordPress post or page. You can add your downloads to an existing page or create a new page. Create a post/page and give it a ‘Title’. Click on the ‘Shortcode Inserter’ to enter the downloadable item you have created. The ‘Shortcode Inserter‘ can be found above the text editor in all WP posts/pages. From the ‘Dropdown Menu‘ in the ‘Shortcode Inserter‘ select the item you wish to put on your page. Tick the box if you wish to include a fancy box. A fancy box includes all details about your download. Select the color you would like the ‘Download Now’ button to be. Choose if you would like the download to open in a new window. Click the ‘Insert SDM Shortcode‘ button. How Does a User Download an Item? Once you have visible items for download on a WP page, a customer can come to that page and click the ‘Download Now’ button. Once they click the ‘Download Now’ button their item will begin to download. Once a user downloads an item, the Simple Download Monitor logs their details. Click on the ‘Downloads‘ menu and then on ‘Logs‘. In the Logs is where you can find the information of all the users who have downloaded your item(s). It includes the title of the download, the file URL, the visitors IP address, the date the download happened, the country where it was downloaded from and the username of the customer. Simple Download Monitor also keeps stats on how many times your item is downloaded. Click on the ‘Downloads‘ menu and then on ‘Stats‘. A graph is shown that will tell you how many times a file has been downloaded. 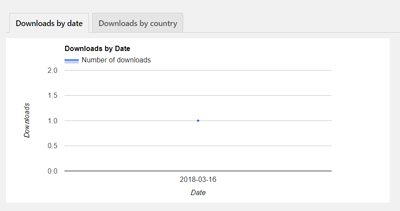 You can choose to sort the number of downloads by date or by country. Every downloadable item you create will also have a page (created by the plugin automatically). Below is an example of the page created when you make a new downloadable item. This page can be accessed by clicking the URL in the edit download interface in your dashboard.